Your company’s health and safety policy may be well established, but how can you be sure that all employees are following the same guidelines? And how do you go about conveying any changes to these policies? Company culture is fundamental to a business’ success, but changing that culture can be difficult, and it’s likely you’ll hit quite a few points of resistance. Health and safety culture is no different, and it’s essential that everybody is on board from day one to ensure any changes are communicated effectively and picked up straight away. As your business no doubt understands already, ensuring that all employees are on the same page in terms of health and safety will greatly reduce the risk of accidents in the workplace. Having a set of standard processes and procedures in place will make it much easier for your employees to follow best practice, and will enable them to do their jobs correctly and safely. But it isn’t enough for employees to simply follow standard processes and procedures; they must all be fully committed to improving health and safety in their place of work. This ultimately means taking responsibility for raising issues, and suggesting improvements if things can be done better. It also goes without saying that a company’s health and safety policies need to be enforced by management; everybody in the business is responsible for safety, but it must be led from the top. While your business is probably very familiar with the concept of creating a culture of health of safety, it can be helpful to remind yourself in order to evaluate your current safety performance. A robust safety culture starts with educating your workforce. You’ll need to make sure everyone is aware of the existing policies in place and understands how to follow correct procedures. You may want to consider setting up regular health and safety assessments for employees (if you haven’t already) to ensure everyone understands what's expected of them. However, one of the most effective ways to create a culture of health and safety in the workplace is to make sure that everyone is involved in the process. For example, employees from the ‘shop floor’ upwards should be part of the team that sets out (or reviews and updates) guidelines for working safely. By consulting the people who carry out particular activities on a day-to-day basis, you may find they have adopted a specific way of doing things that reduces the risk of accident or injury. When using heavy machinery such as forklift trucks, it's important to ensure your employees are familiar with (and adhere to) the manufacturer's instructions, as well as any additional procedures that have been established within your business. To get the best involvement from your employees, you may want to schedule a company-wide health and safety awareness day. This is a great way to educate your employees about the importance of health and safety in the workplace, and get their feedback on existing processes to build ownership of the safety culture in your business. According to the Fork Lift Truck Association, there are around 400 hospitalisations a year in the UK as a result of accidents involving forklift trucks. Many of these are likely to be minor, but a number of these accidents could result in more serious injury or even death. Forklift trucks are incredibly heavy pieces of machinery, with weights varying between one and five tonnes. So it's no surprise that any injury caused by a forklift is likely to be significant, and some may even be so severe that they become life-changing. With this in mind, it's absolutely essential that everyone is aware of the risks associated with not only operating a forklift truck, but the risks to others on the ground. By making sure that everyone in your business knows the risks that surround forklift operation in the workplace, and understand the steps they must take to minimise these and protect the health and safety of themselves and their colleagues, you can greatly reduce the chance of an accident or serious injury. The majority of forklift accidents are caused by the operators themselves, usually through improper training or negligence. But it’s often not just the operators that get injured. Approximately two thirds of all forklift accidents result in injury to someone other than the driver. 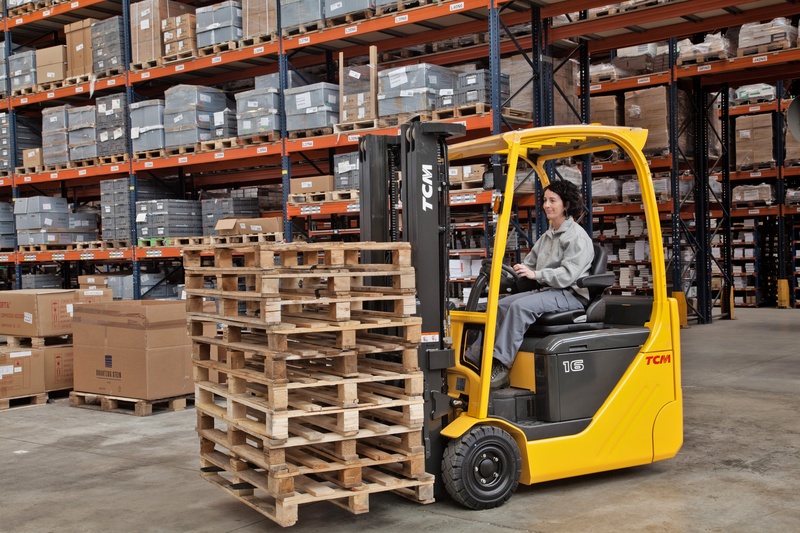 It really isn’t difficult to tip a forklift truck, which is why many trucks come with a range of safety features to combat this. Lifting a load that is too heavy or balanced incorrectly, or even just driving over uneven ground can easily unbalance a forklift truck. Unfortunately these accidents can have pretty severe consequences, with operators or even co-workers becoming crushed, resulting in catastrophic injuries. To prevent toppling, it's important to properly educate forklift operators on the weight limitations of their vehicles and best practices for lifting different loads. This will ensure that the chances of a forklift tipping over due to poor training are kept to a minimum. You should also perform regular checks of your warehouse and operation areas, and report any damage to surfaces as a priority. Forklifts perform best on smooth surfaces, and any areas of uneven ground will not only pose a risk of tipping, but will decrease the efficiency of your truck. Collisions are another common accident and cover any impact between forklifts and objects, other vehicles, or people. Collisions with objects like racking, desks and stacked goods occur regularly, and although a little bump may cause a bit of embarrassment for the operator, a bigger crash may cause heavy things to move or fall, which could potentially land on and injure a co-worker nearby. Collisions with people are much more serious, and can result in life-changing injuries or even death. It's important to educate your entire workforce on best practices surrounding working alongside forklift trucks. It may also be necessary to set up designated walkways for pedestrians to ensure they are kept well away from moving vehicles. Forklift operators should also be aware of correct operational procedures, and make adjustments to their seat at the start of every shift to ensure that they have maximum visibility—not just in the direction they're going, but for the entire area surrounding the truck. Collisions between forklifts (or between forklifts and other types of vehicles) are not uncommon in larger warehouses. As well as causing damage to the vehicles themselves, the impact of such a collision can also cause injury to the forklift handlers. In this case, forklift handlers must be aware of the maximum speeds they can drive at whilst operating in a warehouse environment. Reducing speed is one of the best ways to reduce the risk of collision, as well as checking for problems with visibility as mentioned previously. Usually caused by a forklift collision, unstable or overloaded racking can come down fairly quickly, along with everything that has been stored on it. This is a serious accident and can have major implications for any business. Firstly, it’s likely that there will be multiple casualties, and secondly, the damage to property will be extensive, and expensive! To reduce the risk of total racking failure, you should regularly perform checks on the racking to ensure that it's fit for purpose, and raise any potential issues so that they can be fixed before they become unsafe. You should also educate your forklift operators on the potential consequences of driving into racking, even if it's only a minor bump. Each of these common accidents is easily prevented, but making your workforce aware and arming them with the skills and knowledge to prevent them happening must remain a constant focus of your company’s health and safety culture. To conclude, if everyone in your business is on-board and fully compliant with health and safety best practices, the chances of an accident are greatly reduced. This will allow you to keep the risk of injury to an absolute minimum. For more advice on improving safety in your workplace, talk to your local dealer today. Click the button below to enquire.